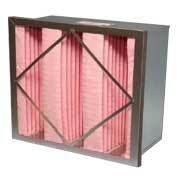 The Camfil Durafil® ES is a 4V-style high efficiency air filter in a compact energy efficient design. Through the use of a wet-laid, mini-pleat design, this filter has the lowest pressure drop and longest service life of any filter in this category. It has earned an Energy Cost Index (ECI) of five stars which is the highest performance rating available. The Camfil Durafil 2V is a compact and lightweight filter of similar design to the Durafil ES, but with half the surface area. 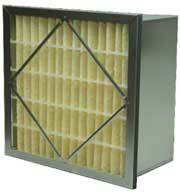 In general HVAC situations, it is an upgrade to the Riga Flo box filter. 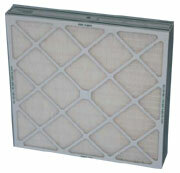 The Farr Riga-Flo® set the standard for rigid box filters since 1976. The Farr Riga-Flo provides high-efficiency ASHRAE air filtration performance using a lofted fiberglass media with a non-wire backing. The Farr Riga-Flo® set the standard for rigid box filters designed for side-access and front-access installation since 1976. The Farr Riga-Flo provides high-efficiency ASHRAE air filtration performance using a lofted fiberglass media with a non-wire backing. The Camfil Riga-V™ provides high efficiency ASHRAE air filtration performance in a rigid box design using a highly charged synthetic media. Like all other charged synthetic medias, the Riga-V will also drop in rated efficiency as the charge dissipates from dirt load and/or humidity. The Camfil Riga-V™ provides high efficiency ASHRAE air filtration performance in a rigid box design using a highly charged synthetic media. Like all other charged synthetic medias, the Riga-V PH will also drop in rated efficiency as the charge dissipates from dirt load and/or humidity. The Riga-V PH was designed for side-access and front-access installations. The Camfil Aeropac® is an age-old design for high moisture applications. Designed with a galvanized box structure and wet-laid fiberglass media in both box and headered (“PH”) versions. The Camfil Optipac is high efficiency ASHRAE filter designed in a 4” deep frame of either moisture resistant beverage board or plastic. The media is a wet-laid fiberglass.